Saturday 4 December - Had a busy day today. Caught Dave's shuttle and headed first of all to Wai-o-tapu Thermal Wonderland. Waiotapu means sacred waters in Maori. Had to be at the Lady Knox Geyser for 10.15am because that's when it erupts. To help it along a bit they add soap powder, because otherwise it would only naturally erupt only every 48-62 hours. It was pretty cool to watch and it got to about 15 metres. I then headed to the main entrance of the park. I only had about 1 1/2 hours to look round as I had to be back on the shuttle at 12 noon. So as I wanted to see everything I had to get a move on. Waiotapu is absolutely amazing - its hard to believe that this can exist naturally in nature. Saw loads of different craters and pools which contained loads of different colours. Some of the best were "Artists Palette" which was a pool with red and green colours, the Opal pool which was also green. Probably the best was Champagne Pool which was a massive steaming pool that had a brilliant ochre colour around the outside. The Devil's Bath was also good and the water was an amazing lime green colour. I also went up to see Lake Ngakoro which is still thermally active and the waterfall that was also there. It was an amazing place to visit - loads to see in such a small area. Got on the shuttle and headed a little way away to Waimangu Volcanic Valley. Waimangu was formed in 1886 by the eruption of Mt Tarawera. I think this park was even better than Taiotapu. There were so many incredible things to see that I haven't seen anywhere else. Frying Pan Lake and Echo Crater were really good - the lake was bubbling away because it was really acidic. At the back of the lake was Catherdral Rock which had red streaks and lots of steam coming out of it. By far the best was Inferno Crater Lake. The colour of the water was a pale blue and the lake was opaque. The lake was extremely acidic and nothing was growing near the water. But it was so beautiful there and I wish I could have stayed longer. There were also some marble terraces and buttresses that were an orange and white colour and these were cool. The walk finished up by Lake Rotomahana which had loads of black swans on it despite being thermally active. Caught the shuttle back to the hostel for a couple of hours chilling. At 6pm went to do the Mitai Villiage Maori concert and hangi. This was absolutely brilliant and one of the best things I've done in New Zealand. We all gathered in the dining area and the evening's entertainment was explained to us. Then we had to choose a man to be our 'chief' for the evening. We were also told that the welcoming ceremony was taken seriously and we were not to laugh during it. So we all made our way out to where the concert was to take place. Thankfully it was undercover as it had started to rain. 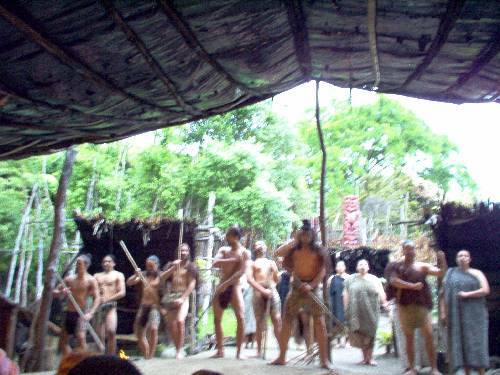 There was a small replica Maori village there. 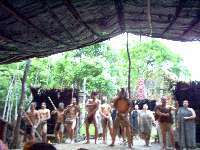 To begin with the Maori chief spoke/shouted in Maori then came down onto the stage and began the Pohiri (welcoming ceromony). He was joined by about 12 others, 6 men and 6 women, although some of them looked like teenagers. They did chanting, shouting, singing, dancing and for a welcoming it was really quite fierce. I can understand why Cpt Cook though he was going to be attacked when the Maori he met did this Pohiri - it is really aggressive and scary (it you didn't know that they weren't going to attack you!). After they had done the pohiri our 'chief' had to accept the peace offering of a fern, make his own short welcoming speach, and then we all had to sing a short Maori song that we had learnt earlier in the dining area (I can't remember any of it now or even what it meant). That was the serious bit over with and then the fun started. The Maori chief now spoke English and he was quite funny. They put on a really good concert - sang song, danced, did weapons display and the women spun these ball things around. They also did a haka which was really cool. Most of the men were not wearing much at all. It would have been better if they were good looking, but they were either really young or podgy. At the end the chief explained what all the tattoos meant and how they used to be done - really painfully! That was the end of the concert so we went back to the dining area for our hangi - a traditional Maori meal cooked in the earth to give it a smokey flavour. It was really nice - and it was as much as you could eat. They also had western food - garlic bread, salads and chocolate log. The hangi was chicken (lovely), lamb (a little dry), potatoes, sweet potatoes (I didn't like these as they had too much of a smokey flavour), and a really nice sliced potatoes in sauce (that wasn't Maori but tasted great). I basically stuffed my face - it was great. After the meal and a question and answer session we went out for a walk in the dark and rain into the forest. There were glow worms in the forest and they are quite a sight. They only show a little bit of light thats looks like a bit a bright blue glitter. We also went to the sacred spring/pool and there were glow worms all along the bottom of the pool - it was really pretty. The guide turned a light on by the pool so we could see just how clear the water was and also that several large eels lived in there. Had a brilliant day today - saw lots of ace things, but I particularly enjoyed the concert and hangi.